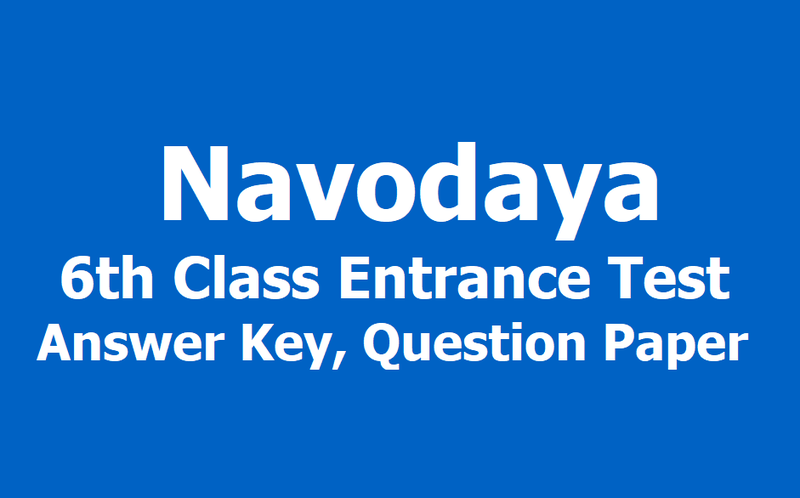 Navodaya 6th Class Entrance Test 2019 Answer Key, Question Paper download: NVS, Navodaya Vidyalaya Samiti Officials issued the Navodoya 6th class Entrance Exam 2019 Notification in the Month of October 2018. NVS invited the application forms from the eligible students who are studying class V for admission into Class VI in in each district Navodaya Vidyalayas of all States of India form October 23 to November 30, 2018. This year, nearly 80,000 students were attended for the statewide navodaya entrance exam on April 6, 2019. This year, the Navodaya entrance test was conducted as per the JNV Selection test schedule and the students are waiting about the NVS exam results. Here, we are providing the Navodaya 6th Class Entrance Test 2019 Answer Key link for downloading for checking your score and also Question Paper. Navodaya 6th Class Entrance Test: Admission in Jawahar Navodaya Vidyalaya is made on the basis of a Selection Test, designed and conducted by the CBSE. The test is called the Jawahar Navodaya Vidyalaya Selection Test (JNVST). It is of non-verbal nature, class-neutral and designed so as to ensure that talented children from rural areas are able to compete without facing any disadvantage. Special care is taken to ensure that children from far flung areas get admission forms free of cost, without any difficulty.